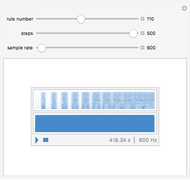 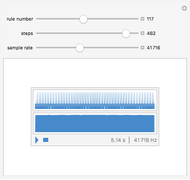 Hear sonic representations of cellular automata. A dare: record a song using only this Demonstration! This was created by simply flattening the array created by Mathematica's CellularAutomaton function and then using ListPlay to hear the result. Rob Lockhart "Hearing Cellular Automata"